The 580-series alpha counters, first introduced in 1979, have been a very successful family that is aimed toward luminescence dating but has had applications in general environmental dosimetry including monitoring of airborne particulates in the vicinity of uranium mines and processing plants. 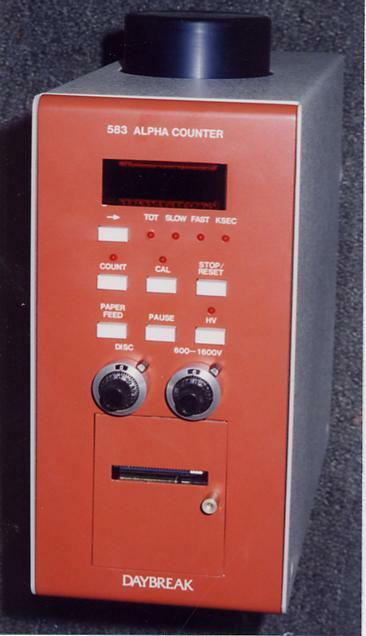 The present model (583) is a stand-alone unit that is very economical compared to NIM instrumentation and includes such useful features as slow and fast pairs counting and computation of the U/Th ratio. Up to 1500 counting periods (1-8 ksec) are stored, and the instrument is impervious to power failure. Some of you have been asking about suppliers of paper for the 583 printer. We recommend Nakagawa Manufacturing (USA) in Hayward CA, USA, whose part number is NAP-0038-015. They take credit cards. Being a Japanese company, they should have sales offices worldwide. This may not be listed in their online catalog, but they carry stock. They also stock paper for the 801 and 801E irradiators. In an emergency we can supply a modest number of rolls, but your least expensive option is to buy the paper by the case (100 rolls) directly from the manufacturer. As many of you know, Wm. Johnson Associates, the supplier of the ZnS(Ag) on mylar screens for many years, has run out of their stock and declined to produce any more. We have been active in finding another source, and now do have another manufacturer in the US. At present the screens are made in small lots and are rather expensive as a result, but they are looking into a continuous spray line in an effort to reduce the cost. We need to encourage them in this endeavor by buying screens even at the price of USD 175 per 100 screens (which doesn't cover our costs of filling an order! ), so that we can get the price down below USD 100 per hundred once again. At that point we will be able to maintain a stock of these screens for our customers.